I will work on the swim, the bike, Yoga and weights this week. I do have a trail run to do on Sunday. It is not a race and I will jog the 8.5 mile loop. I have some new strategies to try in the pool. I am still improving and I love progress. I want to get to where I am completely comfortable at a 2:05 100/m pace. Right now, I am comfortable at about a 2:15 average over a mile long swim. Fact is, I am comfortable at 2:15 for the full 2.4 miles. I am also going to venture back into the idea of Masters swim sessions ... as nerve racking as that is to a noob swimmer. I am looking forward to my long bike session on Saturday too. It is an 85 miler. I am probably going to get up bright and early and get it out of the way so that I can focus on organizing and packing up for the move. The close date on the house is February 27th. We are stoked. It will be nice to be in an ownership position once again. I must admit, it has been a good thing to be a renter to allow us to recover from remodel, repair and upgrade tasks. I guess we really do like home improvement projects and owning is really they only way it makes sense to do those little projects (economically speaking). Just about what I figured. So the foot injury slowed my training earlier in the month. I was concerned about the foot going in to the race this morning. It was cold and windy on the drive out to the FAAAAAARRRRRRR west valley. It was a great place to run. The route for the 13.1 was an out and back with about 300ft of elevation gain out to the turnaround. The GPS charts are misleading. At about mile 8 there is a weird sensation that you are climbing and my time on that mile shows it. My range of pace was between a fairly rapid 6:51 per mile and a somewhat sluggish 7:51 per mile. I finished in 1:37:21. This was my first 13.1 that was not connected to a triathlon. My other race-based 13.1 was at SOMA and it was a 1:54 something. If not for the couple of weeks of slowed training ... I probably could have accomplished the 1:30. I am at peace with the time - because it is pretty solid. Boy am I tired. I have not felt tired like this in a few months. That means I am working at a whole new level in my training. That and I have all but removed ANY junk food from my diet. During my training I feel strong ... but in between those efforts I am wiped. This is apparently the story as one's distance and intensity increase. It's just new territory for me. I have NOT taken enough rest days this month. I think I have four days away from training. On two of those off days I have hiked or walked. Therefore, I have taken two days off out of the last 26. It is time for some rest. I am still learning. This one I am learning the right way ... through my own experience. Other than being fatigued, which is par for the course I chose, I am having a tremendous amount of success. I am getting more comfortable in each discipline. My swim is constantly improving. My bike continues to stay strong and get faster and my run went from almost non-existent in November to 30+ miles per week until the foot issue. I have dropped about nine pounds this month. This is probably contributing to my exhaustion. My body is trying to adjust to the new level of training AND the further tightened diet screws. I am hovering now around 185. I will easily be at my goal weight of 175 - 180 prior to St. George. I think I will even have time to allow my body to adjust to the new weight prior to the big race. The issue I was worried about has dissapated ... my power is still there. Losing the extra weight did not effect my ability to generate bursts of speed. I am taking a necessary day off today. Carrie and I are going for a massage. My hamstrings and hips are tight. I am then going to visit Simon B. for a sports chiropractic session on Friday. I will probably jog a mile or two tomorrow evening to remind my body that we have work to do on Saturday morning. This week has been nice. I am purposely decreasing the training duration and working on intensity. Sunday I walked with Carrie and Baron. That was the extent of my training. My legs thanked me for that. Last week was the fourth busiest training week I have had ... probably ever. The other three weeks that were busier were the weeks leading up to the 70.3 in October. Yesterday I went to the pool at Oh Dark 15 and did a paddles, sprint and endurance swim workout. It felt great. I immediately hopped on the treadmill and worked my way through 8 miles in 60 minutes. This morning I went to the pool again and sprinted out a 550 meter swim in about 10 minutes. Then did another 1000 meters to cool down. It was a good swim this morning even though I felt sluggish. Today is a traditional killer Tuesday ... so weights, spinning and yoga are on tap after work. I am going to work on the foam roller a bit for my hamstrings and quads to start getting them ready for the half marathon on Saturday. Thursday evening I struck out to swim for 90 minutes straight. I accomplished that goal. I ended up swimming somewhere between 2.1 and 2.3 miles. That is the closest I have come to the full Ironman distance in a straight swim. It felt okay. I have definitely had better swims ... then again those better swims were of MUCH shorter distance. I will take it. On Friday, I took my lunch hour to run a 10K. It was a treadmill run. It felt good. I was done in 47 minutes. I am happy with that time. I have one more long run and two shorter speed workouts prior to the half marathon next weekend. Today I did a fun segmented ride with a Triple Sports team meeting mixed in the middle. I ended up riding a little under 50 and I felt good. I made some adjustments to the Specialized time trial bike and it was MUCH more comfortable. I just MAY consider riding it at St. George. I need a few more weeks and some longer rides on it to make my final decision. Spinning three times and riding outside twice this week has really perked up my fitness. I am pleased with my progression. The training is getting tougher but easier at the same time. Aside from some lingering soreness, the foot seems to be improving. Knock on skull. I hope to get my scheduled four days of running in this week. So far, so good. This will be my first four day running week of the year. I had a fantastic December, running-wise but I think that is why the foot thing happned. A little too much too quickly. I have been on the bike every day this week. I am working my way back up to pre-Tour de Tucson levels by doing spin intervals. I enjoy the bike. Have I mentioned that? I swam a whole heap last week, so I thought I would get de-chlorinated a bit this week. I will be in the pool an equal number of days, but the mileage is reduced while the intensity is increased. I have a whole "build then endure" concept I am working with ... beyond normal periodization. Starting to get amped about the half marathon on January 28th. 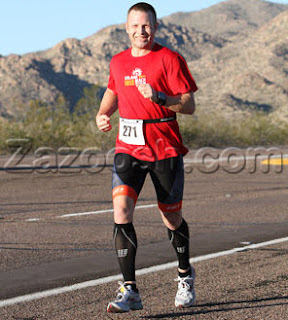 The first race of the year ... and my first ever stand-alone half marathon race. I was on target to hit a 1:30 prior to the foot deal. I will probably be a little slower than that but I believe I can still finish in the 1:40ish time frame. My 13.1 time at the Soma half ironman was 1:54 - so I definitely want to beat that time. Weekend soon! Get out and do something. This article is amazing ... in the worst kind of way. If you are not into clicking on links then I will sum it up for you. "Queen of comfort cuisine Paula Deen confirmed to Al Roker Tuesday that she has type-2 diabetes." This woman has grated on my nerves since she plopped onto the scene a few years back. I let it slide thinking that I was being petty and that some people do like that act she puts on. I blame people like Nancy Grace for that super-fake southern bell garbage. But now - the gloves come off. Bryonman has something to say about this flippant attitude toward health. To me, this is like the smokers of the world that suggest "we are all gonna die anyway". My friend Seth is a smarter man ... here's what he says. "We owe it to ourselves, our family, and our friends to take responsibility for our health. If we are not healthy, we cannot provide and care for those we love. Instead we force them to care for us. Eat well, exercise, and take care of yourself mentally and emotionally. Living foolishly and expecting no bad things to happen is reckless. Expecting medication to fix diabetes or any other health problem after you've done a lifetime of damage is worse. Don't get to that spot in the first place." Having grown up in the south, Carrie and I were / are surrounded with the choices that our families made when we were children about diet. Yes folks, Twinkies, little Debbie’s, donuts and sugary cereal do taste GREAT to children and most adults. It was NOT just meat and potatoes growing up. It was lard, preservatives and way way way too many bad carbohydrates and calories. The difference is that this was the 70s. Our parents did not have the information that we have today. For a public figure like Paula Deen to come out and suggest that she refuses to change anything about her diet and diabetes is absurd. Contrary to your southern wisdom Ms. Deen - this is a death sentence. Medication is not the answer. You are 64 years old. Act like it. Why do you care Bryonman? Well, to me it is a painful thing. I spent 12 years being an athlete trapped in a body that drew a picture of my unwillingness to make correct choices. At 37 - I finally grew up a little. I started making much better choices with my food. Take away triathlon and I would still be 25 pounds lighter than I was last January because I am executing on what I have KNOWN for years about nutrition. I struggle with proper food choices daily - even today. The struggle has decreased over the past eight months or so, but I speculate that I will continue to have issues with this for the rest of my long life. I welcome the challenge. I feel like I have added 15 QUALITY years to my life just in the past year. I was headed down the wrong path. 225-230 pounds and 5'11" tall with a 42 inch waist is not a good place to be - no matter how hard you try to hide behind the "big-boned" garbage. That said I still have work to do. I still have a few pounds to shed. I have to say this again to clarify my stance and purpose. NONE of this triathlon journey is about vanity, fame, fortune, athletic prowess or arrogance. What it is about is confidence, change and health. I have so many things I WANT to do before my expiration date that I refuse to limit those items because I like bear claws and Barq’s. I am not one to spout and spew without solutions. 1) If you want to change your health and appearance, start simple. Change one thing at a time. If you drink a two liter of soda per day ... drop that first and leave everything else the same ... etc. 2) Healthy food is NOT more expensive. Healthy food is more filling in most cases and thus your meals go further. Oh and use some logic - what is more expensive ... a slightly higher monthly grocery bill or constant medication and trips to the doctor for diabetes? Do the frickin' math. 3) If we ALL change one thing in our diet and exercise habits - it is my bet that our health care system would improve and our overall success on the globe would improve. This is a land of choices, so empower yourself to make the correct choices. The Internet is awesome. Do some research. 4) Cooking is too time consuming and messy. Bullcrap! Get a crock pot and then start scouring the Internet for recipes. It is amazing. Slap some items in the Crockpot - leave for work - come home to a dinner that is easy and nutritious. The house will smell good to boot. DO THE FREAKING RIGHT THING. If my tone is offensive in this writing - stop reading. I have never watched Paula Deen's show and I am done ranting about her. I could change the channel before. However, with her proclamation about her diabetes I could not, in good conscious, let this slide. I have family members that watch her show and that cook like her. I wanted needed to voice my concern. Am I being judgmental? Probably. Do I care? Not really. I love life. I am learning to like myself more and I want everyone around me to read and absorb this. The 140.6 journey is making Bryonman into a new person. He will be more likeable, more genuine and easier to be around. In Waterworld, Kevin Costner's character "the Mariner" had gills and webbed feet as a adaptation to the water bound world around him. Where are mine? I spent a tremendous amount of time and mileage in the pool this week. Guess what? I enjoyed myself and gained more confidence in the water. I have had two weeks in a row of really solid training even though my running has been limited. Congratulations to all my friends that ran the PF Changs 26.2 and 13.1 in Tempe, AZ today. It was fun tracking you all from afar. I must admit that I have no interest in dealing with all the traffic and parking woes to get to and from that race. I ran tonight - 3.15 on the treadmill. Very slow pace but no real pain the foot either. Cranked the last .15 at about 9.5 mph. Shhhh -- don't jinx it. Which Friday the 13th movie is your favorite? I don't really have a favorite because they are all pretty cool and very cheesy in their own special way. I have had another good training week despite the lingering foot issue. It is much improved this morning. The last time I tried to run was earlier in the week. It was time to rest I suppose. I also had a good foot massage last night at Massage Envy. I was given a brief lesson in reflexology. With three strong spin sessions, three strong swims and two Yoga sessions this week I am feeling pretty darn comfortable with where I am in the training. The main thing to me is that I remain consistent. We have our home inspection tomorrow for the place we made an offer on ... and I hope it inspects well. I know the sellers are ready to go and we are too. Baron can't wait to get to his new yard and neighborhood. Before the home inspection I have a swim and bike brick scheduled. It has been a bit chilly the past two mornings. It's like it is January. Bryonman: "When it hurts you stop. Don't be a hero." So yeah, the foot thing is minor and is easily overcome ... if I just leave it alone and let it "heel" [it's actually my left foot]. I had a good training weekend. My bike workout on Saturday was exceptional. It was the strongest I have felt on the time trial bike. I do miss my road bike. I can't wait to get it back. I took Sunday off to rest and we looked at 8 or 9 houses. Guess what? We have an accepted offer on a home. It is just a half a mile from the Phoenix mountain preserve so we will have great trail access if the deal goes to completion. After we take posession and move some things in I will post some photos. It is going to be nice to own again ... even though that comes with a fair amount of headache as well. We did a hill workout in spin class last night and followed that workout up with an hour of yoga. Yoga helps me. I feel better today and I am going to attribute that to the stretching and breathing in yoga. This morning I was at the gym at Oh Dark 15 for a swim workout. I wanted to swim for an hour straight through. I ended up swimming for 75 minutes and covered 3250 meters. That is my longest swim to date. I swam all of it in a lower heart rate zone and definitely could have done some more. Then I got on the ol treadmill thinking that the foot would be ready. The first mile went well because I went so slow. I moved up to 7 or 8 mph and the dull pain came back ... not on every stride but often enough to be annoying. I pulled the plug. It is frustrating. I have time. I am going to start with the source and assume that either my insoles are worn out or my arches are collapsing and I need more support. It is what it is. I will probably replace my run workouts with ab work and yoga. Yeah - so I went out did a brick on Monday. What I failed to mention was that I felt some sharp pain in the ball of my left foot toward the end of my run. I tried to run on it on Wednesday. That was a no go. It was not debilitating. In fact, I don't even feel the pain until I get up near a reasonable running pace. I changed out my shoes and added some padding today and ran a slow 5K with Baron after I swam and biked. It went well. I felt strong but I held myself back because I do not want to anger this issue. Then I fessed up to the coaches about the situation and they were NONE TO PLEASED with me. I was told to stop running and get an XRay. I just love training so much and everything is going so well I am afraid to disturb the groove. I know ... everyone is correct but I feel good and I want to go. I am going to do the right thing. I am excited that Carrie is going to try and do some of my cycle workout with me this weekend. Her knee is going a little better so we are going to try and get her some mileage. Wish us luck! I started a new job on Tuesday. So far so good. Already accomplished some usable work that is going in to production on the web site soon. 22 days until my 13.1 race. I am eager to return to form. This injury is minor. It will not hold me back long. I promise. Meanwhile, I will bike and swim. I am going to ease back into my hill work. I made it down to South Mountain today. I think most everyone else in Phoenix was there too. It was crowded. I rode up to the towers in about 27 minutes on the Tri bike because the roadie is in the shop with frame issues. Then I rode out to the end of San Juan and back to the car for a 20 mile ride with about 1000 feet of climbing. Then I drove back home and set out on my run. It was warm today in Phoenix. I had a decent run. I kept the pace very managable. I am trying to train my body to burn fat calories rather than just live off sugars. I think it is learning. There's nothing like 13.1 miles of running to give you some time to think. I have already run more miles in the two days of January than I did in the whole month of November ... because I was focused on the bike. Time to give the legs a break and work on the swim. I completely lost my voice last night at our small New Year's gathering. It was quite entertaining really ... since I felt fine other than the absence of vocalization. Playing Cranium with a group without a voice is still rewarding for me. I am going to try and sneak in a short bike and run this afternoon if I continue to feel better. I have my voice back, much to Carrie's dismay. Happy 2012! Here we go! 5 months and 4 days until St. George. I will be ready. I am moving in to the first of my "build" phases for my training beginning tomorrow. I start my new job at GoDaddy.com on Tuesday. I am looking froward to it. Update: I did get out for an hour on the bike and a 5 mile run. Surprisingly they felt okay once I shook out the cob webs on the bike. It was still fairly warm even at 6 when I finished the run. Good times!